My first impression of Freedom Lures’ products was that it was something new that might be something very good. I liked the idea of being able to change a hook for a difference in size type or if it had been dulled. The packaging was laid out so I could see what was unique about the lure and I didn’t have to hunt for the size, but the retro style and colors of the insert card would not jump out from a wall full of lure packages. I was impressed with the paint finish. That popped! You could see that the hooks were of high quality as well. The lure is based on standard jig head shapes with the capability to change hooks to any style the angler chooses. The hooks are free moving, something that fisherman want for certain applications. This swinging ability works well with a swimbait and football style head. Though some anglers feel that this swinging hook concept helps keep a fish on the hook, I believe that on a headshake the weight being able to swing and pick up momentum enlarges the hole in the mouth of the fish. A screw-in wire soft plastic keeper is used to hold the trailer in place on the stealth Jig. I found it a bit large and long for my taste. The jig heads I tested are made of lead and have a brass inner chamber that projects sound and houses the wire hook fastener. I am a firm believer that nothing transmits sound better than brass. The designs are standard jighead shapes without any major innovations in styles. The silicone skirt on the Stealth model is sparse. The color match to the head was acceptable. I only saw the Golden Shiner color and it went well with the green pumpkin trailer I chose to use it with. It would have worked well with an Alabama craw trailer as well. They have only two choices of colors which is a bit limiting. I found the skirts to be on the hard side and not very flexible. Premium Black Nickel Finish with terrific points. Heavy duty for sure. Two hooks with each jig. I fished both jigs in big water, Waddington in the St. Lawrence and Southern Lake Champlain. The St. Lawrence was extremely clear and the lower end of Champlain was fairly clear to stained in spots with 12” of visibility in the stained areas. Water temps were in the mid 70’s. I fished the Stealth jig with a Green Pumpkin Speed Craw Trailer and the Hydra with a Keitech 4.8” Fat Swing Impact Swimbait in Gold Flash Minnow. Both were in the Golden Shad color. Both Lures were tied onto 7’ Med. Hvy casting rods with 6.1 reels spooled with 17 pound fluorocarbon line. I fished with lures that I normally use to locate fish and in this instance I was fishing lures of the same type as I was testing. 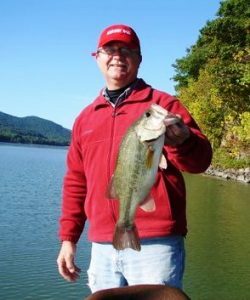 I was unable to find a smallmouths bass bite when we were at the St. Lawrence but found Largemouth Bass on almost every weed edge we came across. Once I located fish I would change to the rod with the Freedom Lures Jig and if the bite fell off switch back to the original lure. I did not see any increase in amount, frequency of strikes or size of fish when using the Freedom Lures Jigs. Unfortunately there was a bit of a drop off in the frequency of strikes when I switched to the Stealth model at the St. Lawrence. I caught some fair sized pike on the Hydra and found them to be durable. The finish on the heads held up and I did not have a single bite off. The swinging hook gave the swimbait a secondary wiggle or shimmy that it didn’t have on a fixed hook jig. When we took the jigs to Lake Champlain I fished them from 3’ to 100’ deep. I used the Hydra in Golden Shad with a Gulp Smelt 5” swimbait as the trailer. We were vertically jigging lake trout from 85’ to 100’ deep on humps. I switched from the EWG to 5/0 O’Shaunessy hook with the hook exposed. I got four hits on the Hydra but I was unable to hook into a fish. It also caused the line to tangle from swinging on the drop. I believe that the tangles are due to the hinge point being close to the line tie. I had 6 lake trout to 14 pounds for the day. They were caught on slim bodied swing hook jigs called diamond jigs in the Northeast Coastal Region. I used the Stealth model at the southern end of Lake Champlain the following two days. I used generic bass jigs in 3/8 oz. with a large beaver type trailer to find fish and then switched to the Freedom Stealth. I did not get a strike on the stealth. I thought that perhaps the difference between the ½ oz.Stealth and the 3/8 oz.generic jig I was using was a difference in drop speed and that may have been the problem. I switched to a ½ oz Keitech jig with a speedcraw trailer and immediately caught fish. This combo has a very quick drop speed. I used green pumpkin and pumpkin colored jigs to catch fish, so color was not an issue, as these were a close match to the color of the Freedom Jig. Maybe the head was too bright, I don’t know, I was unable to determine why it didn’t produce. The third day was a repeat at the south end of Lake Champlain. I caught fish on my usual jigs but didn’t connect on the Freedom Stealth. I did get some hits on it, but it had to be swimming horizontally. The partner I fished with tried it to see if it was me not having confidence in the lure and he did not do well either. He felt that the swinging hook pulled the jig over on its side when it was stationary on the bottom. We moved into the extreme shallows and he showed me that the trailer didn’t stay up at rest. That may be something to research further. We continued to pitch to scattered clumps of milfoil in 4-6 feet of water in a cove, he would throw the Stealth and I would throw a fixed hook jig. The fixed hook jig was the producer with all of the strikes coming on the fall. We changed trailers on the Stealth to Strike King Rage Tails to cause more noise, we tried a Producto plastic worm as a trailer to quiet it down, but could not come up with a combination that would work with the lure. The swinging hook definitely adds something to a swimbait. When jigging the Stealth after punching through the pads or in a hole in water chestnut the swinging hook adds to the looping motion as the bait is jigged. Excellent for weedless applications. You can customize it to suit your needs, going with a slimmer offset style hook in moss or a bigger EWG hook or straight shank Sproat when flipping in harder cover or pads. Quality Control in the manufacturing process is evident in every aspect of the construction, with quality components used for every part of the lure. I found the head held up better than most jig type lures. I banged it off of rocks, bridge pilings, boats and steel bulkheads and didn’t get chips. Some matte spots from hitting things but the paint held up. The hooks were very sharp. I like the forward thinking that brought the lure to market. I love the idea of being able to tune and change on the fly. I truly like the lure. The system developed to change the hooks is beautiful in its simplicity. I’d like to see the stealth head changed so that the trailer is forced to stand a little higher and looking at the engineering in this lure I’m sure the developers will come up with a way to do it. The paint jobs are great, but there is a need for a wider selection. I like designer colors, but straight black wouldn’t be a bad choice to have on the Stealth model. A predominately white pattern and a chartreuse pattern wouldn’t hurt the Hydra line either. I did not have much success with the lure, that being said I think there is a place for this lure in my arsenal. As a swimbait head I think it up near the front of the line for a casting swimming presentation. I think this lure is aptly named as it does give an angler exactly what it advertises, freedom to change. The lure is well engineered and is manufactured using quality components and finishes. Its price point is a quite high but when you examine it closely the price is justified. I have mentioned what I would change in design for the Stealth model regarding the trailer not standing up. I didn’t care for the spiral wire keeper for soft plastic trailers, I prefer a barbed spike as it is more forgiving and the keeper they use on the lure is rather large. I’d like to see the heads a little smaller on all of the styles, if that can be done with the removable hook feature. The skirts on the Stealth need to have more strands and be a bit more flexible. The color selection needs to be expanded as well. I think that these lures could carve out a tremendous niche as a Flounder lure in salt water and as a swimbait jig head for Striped Bass. I would recommend this product to other anglers and would be curious to see what combinations they came up with.